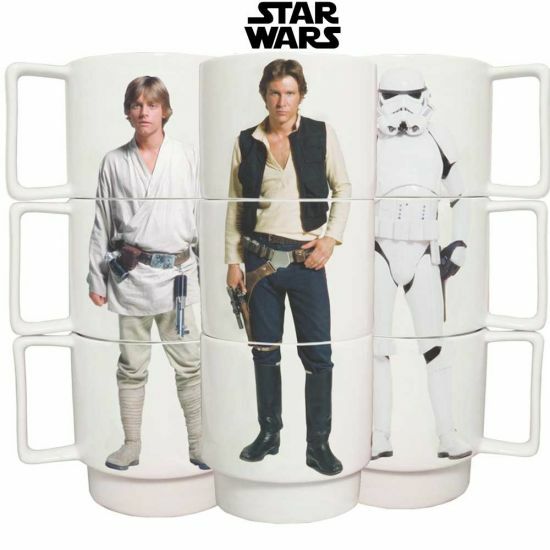 Star Wars Stacking Mugs to twist and mix your routine morning coffee! When stacked, they form the entire body of the character. However you choose to stack, add a galactic twist to you afternoon cup of tea! The mugs can be displayed in your kitchen to amuse family and friends. Or give a Stormtrooper some funny Han Solo leather boots. However you choose to stack, add a galactic twist to you afternoon cup of tea! The mugs can be displayed in your kitchen to amuse family and friends - stack the mugs up and pivot them around to create crazy combinations!